Soothing Stars Auto Sensor Night Light, Automatically Turns On In The Dark & Off In The Light, Provides A Soft Comforting Glow, This Nightlight Automatically Goes On When It Is Dark & Off When There Is Sufficient Light, The Bulb Does Not Generate Any Heat. 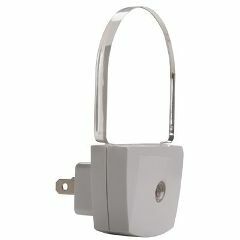 Enclosed Bulb, Prevents Child From Being Able To Touch The Bulb, Option To Screw Nightlight Directly Into Outlet Plate Prevents Removal Of Nightlight To Expose Outlet. Stars & Moon Shapes To Comfort The Child. Auto-Sensor, Parent Does Not Need To Remember To Turn The Nightlight On & Off.